After last weeks podcast of Esoteric Italian Beer, Mark said he’d never had a sour beer, there for couldn’t rate the Panil Bariquèe Flanders Red. So this week, all sour beers! With me on this podcast was Mark Jackson and Corey Greenberg. The only prerequisite I have for the Beer Brawl™ is a love of beer. You don’t need to know anything about the beers we are drinking only a willingness to try them and voice an opinion. Honestly, I was a bit nervous about doing this beer brawl. There is such a negative feeling about sour beers and Corey and Mark had never had them. At least Corey and Mark are up to trying new stuff, even if it is forced by the recording. 🙂 Our mantra is a willing to try new beer and voice an opinion and that is exactly what they did. First up for the night was a Berliner Wiessbier from Dogfish Head named Festina Pêche. Without a lot of experience with this beer we were all very pleased with the refreashing dry tartness of the beer. Another good beer from the folks at Dogfish Head Brewery and a great way to start this adventure into sour beer. Next was the Lindemans Pêche Lambic, which in m opinion was more of a schnapps then a Lambic. It was intensely sweet with a bit of sour underneath the sweetness. While a very common beer, in our opinion not a very good example of a Lambic beer. Taking yet another 360 degree turn, we moved on to the Cantillon Rose de Gambrinus. This Raspberry Lambic was about as tart and puckering as you get with this style of beer. If you’re able to make it past the tartness, there were some wonderful raspberry and mint flavors in this beer. While I enjoyed it; my counterparts had some different reactions! 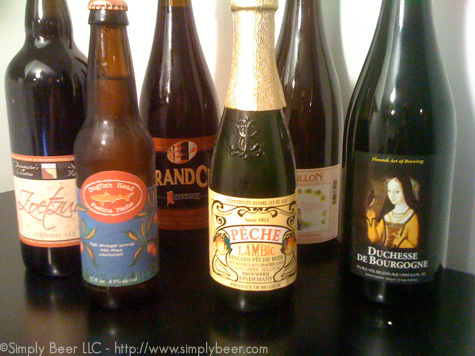 The Duchesse de Bourgogne was next and our first step into the Flanders Reds for this podcast. Both Mark and Corey, I think, were expecting something like the Cantillon, but were greeted with a very well balanced and mildly sour beer. We all did enjoy this beer, a great example of an entry level Flanders Red. In our style of flip-flopping with this podcast, the Zoetzuur let us all down. While it seemed to have an OK aroma, the taste had a flavor that was off putting. None of us really liked this beer, but it was still better then the Lambics we’d had. However, we did conclude the night on a great beer, the Rodenbach Grand Cru. This was a very sour beer, but expertly balanced to round out the sour with some earthy and fruit flavors. All of us really enjoyed this beer. Next week will be Pumpkin beer! I’m working on future Beer Brawls™, we have Belgian Quads, Trappist Ales, and American vs German Oktoberfest Beer Brawls™ coming up. We’d love to hear your suggestions! The Cantillon is certainly the most intense of the six. I think if you had tasted it last, you might have gotten a better experience with it. Also, the Lindemans is hardly a lambic. There’s a reason people have to cut it with hefeweizens. Finally, the Zoetzuur is a wonderful beer, but again probably a victim of the order of tasting. Putting it as one of the first two beers probably would have produced a better result. Still, it sounds like you got a bad bottle. Yeah, we had a hard time putting the lindemans in the lambic category. Aside from the Zoetzuur, had some good beer. In the podcast I describe the Cantillon as”puckerliscious” . Since we had not had many of these beers before, it was hard to figure out the order, so I just grouped them by style. I’ll have to give the Zoetzuur another try some time.